I’ve been wanting to do this cook since I first got my BS. 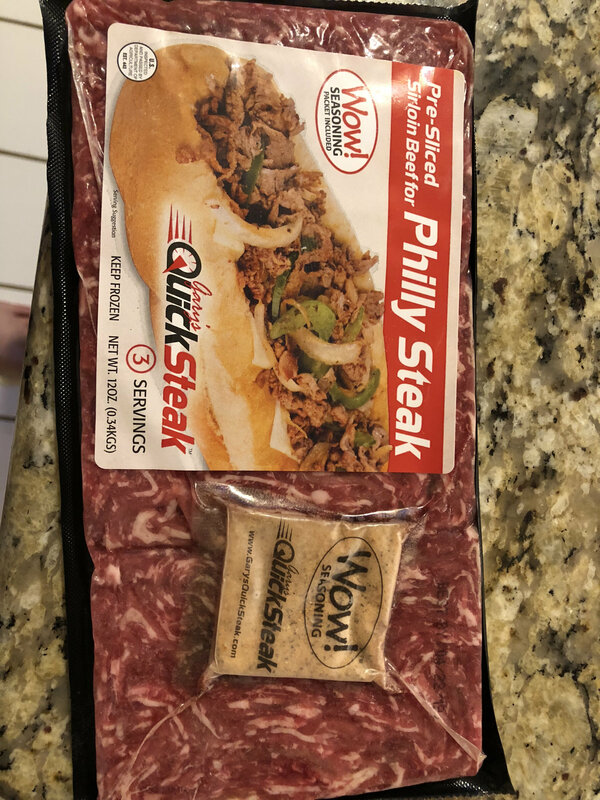 Finally found prepackaged thinly sliced sirloin for cheesesteaks at Market St. I might have committed some kind of philly blasphemy (blasphilly?) given I used some 3-pepper Colby jack cheese and Whataburger creamy pepper sauce, but they turned out fantastic. Will be sure to stock up on this steak next time I see it. Thanks for looking and thanks to previous philly posters for the inspiration! I'd hit that like a fat kid at a carnival. I saw that at Market Street last time I was there. May have to give it a try now that I've seen you cook it. That looks fantastic! Did you find it at the meat department? I'll have to tell my wife to pick me up some on her way home from work. When I saw it it was in the meat department. In one of those coolers in the middle of the aisle. @Griffin like @TexasRebel said I found it in a small standalone cooler. However at my store it was actually down by the dairy section for some reason. This makes me wonder whether I should have bought more when I saw it. Thanks folks for the kind words and good luck tracking it down. Edit @fishlessman I have never been able to come across shaved beef at my local supermarket so that's why I was excited to find this. But yes you are correct it is simply shaved/thinly sliced sirloin. With regards to the seasoning packet, I did use it, but I also put a healthy dose of DP Raising the Steaks on for good measure. I would have guessed they wouldn't do it because they would have to completely clean the machine after raw meat was on the slicer. Trader joe's has great shaved steak, 8.49 a pound here locally. Used to eat Steak-Umms occasionally. Haven't in years. I just looked to see if it was still sold and found this from 2012. No surprise. "[C]hopped and formed emulsified meat product that is comprised of beef trimmings left over after an animal is slaughtered and all of the primary cuts, such as tenderloin, filet, and rib eye, are removed … The emulsified meat is pressed into a loaf and sliced, frozen and packaged." Is Gary's Quick Steak the same thing or is it real sliced meat? Also, how thick are the slices? 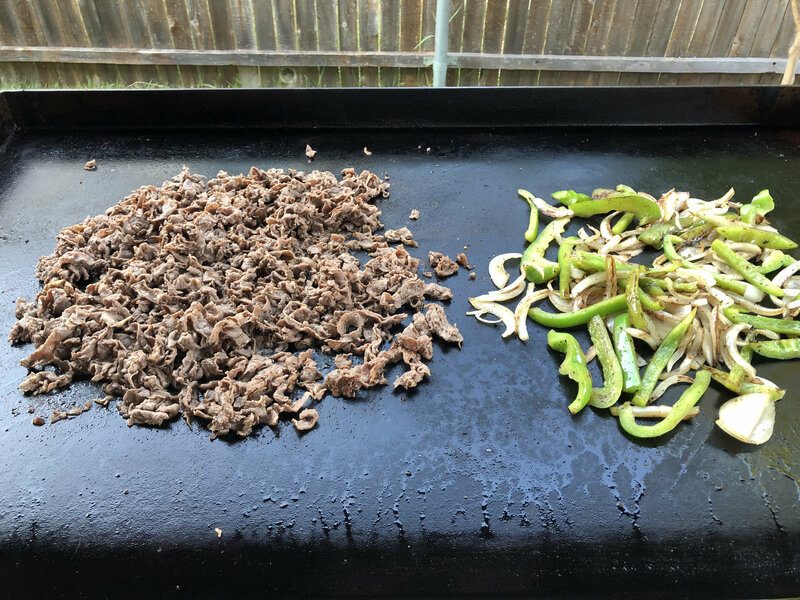 Anyway, I thought authentic Philly cheesesteaks were supposed to be ribeye. No? @Carolina Q this stuff was at least real sliced sirloin, it was not an "emulsified meat product." The slices were pretty thin, maybe 2 or 3 mm? You may be right about authentic version using ribeye, I have no idea. Yeah you can find these in the cooler section of most groceries now, I still tend to find it's not the proper cut of meat (too lean) or its still too thick. I'm from Philly, so if I do them at home, I get a decent ribeye (only way to go), freeze it and then slice it when its part-frozen real thin. Flat top, decent roll, wiz done and done. Still trying to find a way to take the classic Italian roast pork sandwhich but cooked on the BGE.. Still trying to find a way to take the classic Italian roast pork sandwhich but cooked on the BGE..
@Kupkaked, I haven't tried this yet, but here's a recipe for a Dinic's clone (slow cooker, but I'm sure it could be adapted). 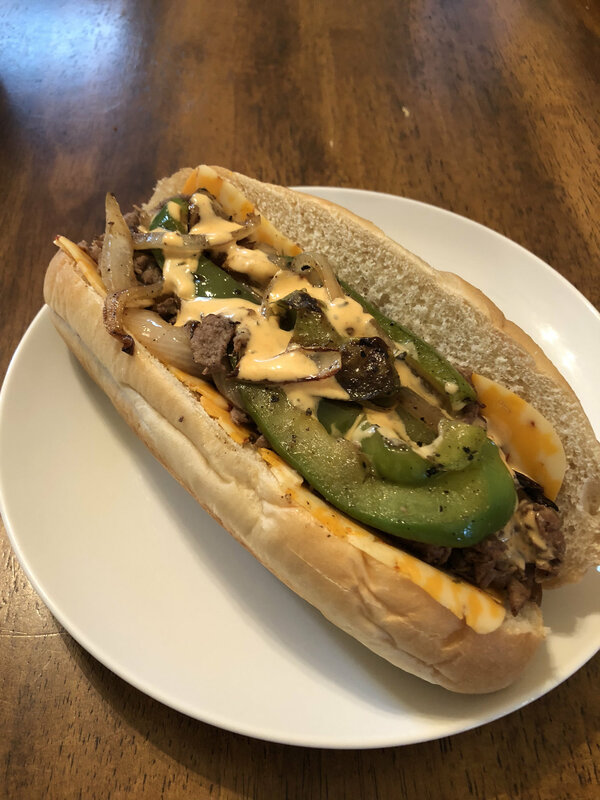 Last time we did Cheesesteaks I used boneless ribeye roast that I'd Egged for Christmas. I made sure to oversize the roast so we'd have savory leftovers. Savory was an understatement!